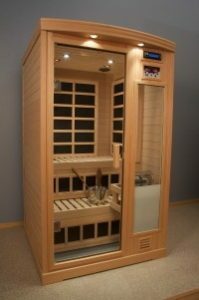 Who can benefit from regular use of a Finnleo CarbonFlex Infrared sauna? * ATHLETES: Use the sauna for pre-workout warm up and post workout healing. * TEENS: Use the sauna for acne relief. manage and reduce pain, increase joint mobility, release endorphins and feel better. * WEIGHT WATCHERS: Use the sauna to burn calories. their massage. They’ll feel better and enjoy a deeper massage. You won’t have to work as hard! the effects of low-light depression especially here in our dark winters. younger. What makes a person look old? A stiff walk! Regain flexibility in your body with regular sauna sessions. yoga postures in the privacy of your own home. YOU: if you’re looking for success, health success… no sweat! Free delivery and set-up for most Finnleos Saunas-only from Olympic Hot Tub Company! My girlfriend just started doing hot yoga about 3 months ago. I thought she was CRAZY. She absolutely loves it now. This would be the perfect gift for her. Right now she’s just cranking up the heat in the shower and wasting a ton of money doing it.